Long before being stabbed and apparently overcome by Snow White, the evil Queen Ravenna (Theron) he witnessed how his sister Freya (Blunt) suffered a heartbreaking betrayal and fled the kingdom. 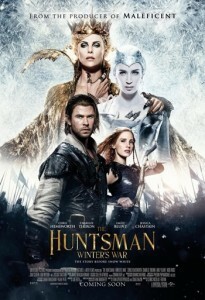 Using his ability to freeze any enemy, young Ice Queen Freya has now been decades in the distant Winter palace forming a legion of deadly hunters, which counts among its ranks with Eric (Hemsworth) and the warrior Sara (Chastain), when discovers that his two champions have failed the only rule imposed on the soldiers love forever banish from their hearts. Upon learning that his sister is dead, Freya meets the rest of hunters and orders them to bring the magic mirror to the only sorceress left alive able to harness its power. But when it finds that it is possible to resurrect Ravenna, the evil sisters sow terror in the kingdom delighted with power twice darker than ever known. Now his growing army will be invincible … unless hunters banished for breaking the golden rule of their queen are able to overcome all the dangers to meet again.